The Sierra Club Atlantic Chapter supports the goal that New York State be fully powered by New York renewable energy sources of wind, water and solar by 2030. We are working to support wind energy as an essential part of this renewable energy goal. 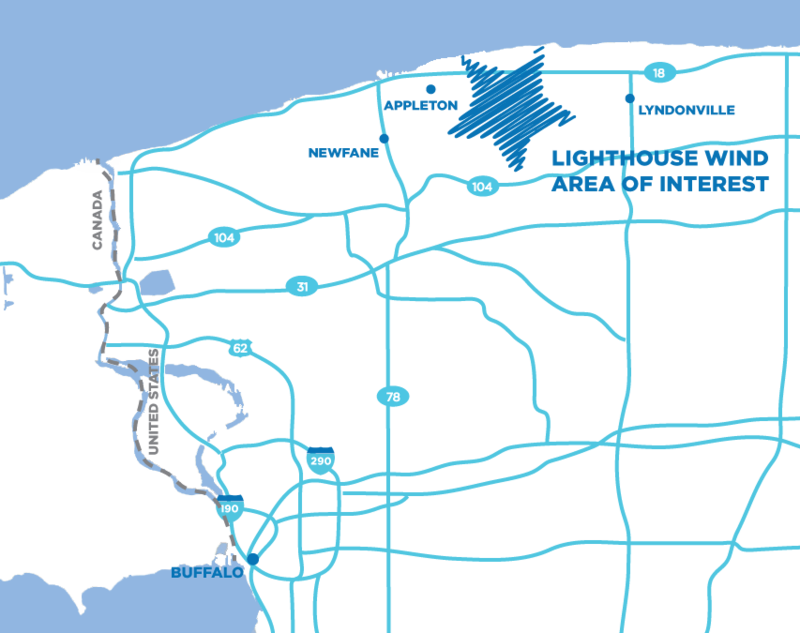 Maple Ridge Wind Farm, at the eastern end of Lake Ontario, can serve as model for Western New York. The Sierra Club strongly endorses wind energy as one of the forms of renewable generation that will be required to move us off fossil fuels. Sierra Club Atlantic Chapter which covers NY State, has endorsed the Lighthouse Wind Project. The decision to endorse this project was made following the announcement of the site plan for Lighthouse Wind in Niagara and Orleans Counties, and attendance at a public meeting that explained the site selection, setbacks from homes, roads and the school within the project area, and the extensive and careful studies of wildlife and habitat protection. Q. Why should we pay more for expensive wind? Isn’t this just giving government handouts to support one industry over another? Nine major and statistically reliable studies covering roughly 270,000 property transactions by different respected and independent organizations in three different countries and spread over 15 years, have found no correlation between operating wind turbines and negative property values. In fact, three studies found slight but statistically insignificant improvements. A study released in 2014 titled Relationships Between Wind Turbines and Residential Property Values in Massachusetts, studied 122,000 home sales from 1998 to 2012 located near existing and future ‘utility-scale’ wind turbines. The study of densely populated Massachusetts found no evidence that wind turbines affect property values. Evidence suggested that in some cases the announcement of a wind facility had a slight adverse impact on home prices, but that those affects were no longer apparent after turbine construction and eventual operation commenced. A recent study published in the Canadian Journal of Agricultural Economics in December 2014 by the Canadian University of Guelph, studied some 7,000 homes and farm sales near one of Ontario’s first and largest wind farms completed in 2008, some 60 miles northwest of Toronto. Analyzing sales data over an 8 year period, the study found that the 133 turbine wind farm had “no statistically significant affect” on property values. The country of Denmark, a densely populated country that is approximately one-third the size of New York State, has 1,500 operating onshore wind farms. Germany has over 4,000 onshore wind farms of varying sizes. Are wind turbines harmful to birds? Scientific studies agree that loss of habitat is the main human-generated cause of excess bird deaths. Also, millions of birds are killed annually in the US by collisions with buildings, according to a 2013 study in Wilson Journal of Ornithology. Electrocution from birds flying into power lines, pesticide poisoning, oil spills, cars, and communication tower collisions are other major sources. Cats, both feral cats and outdoor pets, are a major cause of songbird deaths. Human-influenced climate change disrupts birds’ food sources, with predicted extinction of many species if climate change due to fossil fuel burning continues. 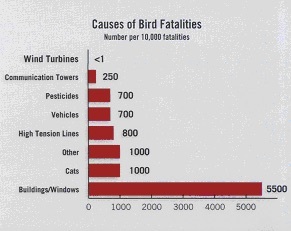 Compared to all these sources, wind towers are very far down the list of human-based causes of bird deaths, with combined estimates from scientific studies averaging less than 0.01%, (one hundredth of one percent) of bird deaths related to human activity. As wind technology develops, adjusting the sites of wind turbines can diminish the small number of bird collisions, for example, avoiding narrow migratory “funnels” where birds follow a specific path between mountains. (An often-cited study of raptor collisions was in one of those areas, in California.) A study of the Lake Ontario shoreline by the New York Great Lakes Protection fund shows that the lake shores of Niagara and Orleans counties do not have high concentrations of migratory birds, compared to areas closer to Rochester, and the migration paths are spread out along the shore, so careful siting of wind turbines will reduce the risk. Scientists Knopper and Olson published a review in 2011 in one of the most highly regarded journals in this field, Environmental Health. They reviewed EVERY published study on this topic that followed the basic rules of scientific research, regardless of their conclusions. Of the hundreds of published articles, only 15 met these scientific criteria. You can read their complete review here: http://www.ehjournal.net/content/10/1/78. After analyzing all the published information from many countries including USA, Canada, Denmark, Sweden and the Netherlands, Knopper and Olson concluded that there is no evidence of physical effects of wind towers on health. Wind energy saved Western New Yorkers $31 Million by David Bradley and Bob Ciesielski. Data confirm that wind energy is viable and is saving New Yorkers money. This article appears on the Sierra Club Atlantic Chapter’s website. Town of Sheldon Wind Project – The Sheldon Town Board has not levied any Town taxes since 2007. Revenue received from the Wind Project has covered all costs of the yearly Town budget.